Anthony Wayne Moore (September 5, 1967 – May 7, 2013), better known by his stage name Romanthony, was an American disc jockey, producer and singer. He was best known for his work with French duo Daft Punk, in which he provided the vocals for "One More Time" and "Too Long" on their Discovery album. On November 7, 2012, he released his final musical contribution in the song "2Nite4U" with Kris Menace on his vocal collaboration album, Features. Romanthony's work crossed several genres including house, R&B and hip hop. Tracks like "Hold On" make extensive use of sampling with a distinctly soulful house feel, while the later "Bring U Up" uses a James Brown-style breakbeat. 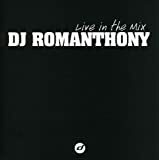 Romanthony appeared on Black Male Records (his own label), Roulé, Dim Mak Records, Azuli, Play It Again Sam (PIAS), Compuphonic and Glasgow Underground Recordings. He died on May 7, 2013 at his home in Austin, Texas, due to complications from kidney disease, according to family members. He was 45 years old.